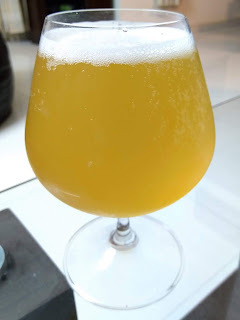 Last summer I did some experiments with sour beers, some of them did not go very well. I am determined to master the basic souring process this year. Let this be the Summer of Sours !! So I started with an easy style, which will make a good afternoon beer. - Goze. This is a historical German beer style, which was difficult to find outside Germany. But a lot of craft breweries around the world are making it now. This was a simple recipe with a 50:50 percent Pilsner and wheat malt. I wanted this beer to be refreshingly sour, but not so sour that it gives you a headache or makes you wait a few minutes after every sip. This is an important factor to decide the pH of the soured wort. More on that later. There are many souring methods, but I am going to use kettle souring, since it the safest and the easiest. Add the souring bacteria to the kettle itself, let the wort sour in the kettle for 48 hours, boil the wort to kill the bacteria, and ferment the batch as usual. There is no risk of infection. Step 1 - Perform the mash and collect the wort into the kettle. Step 3 - Get a fresh sealed packet of Dahi and hang about 150g of Dahi in a muslin cloth to separate out the whey. I used Chitale Dahi for this batch. Make sure the pack is completely sealed and has been stored well. We want active bacteria. 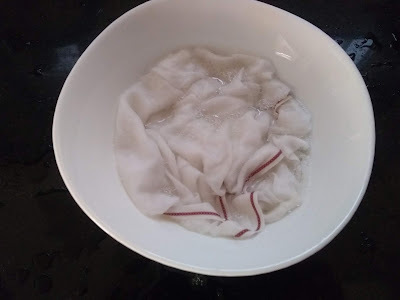 You can do all this in the 15 mins when the wort is boiling. Squeeze the santizer out of the cloth. 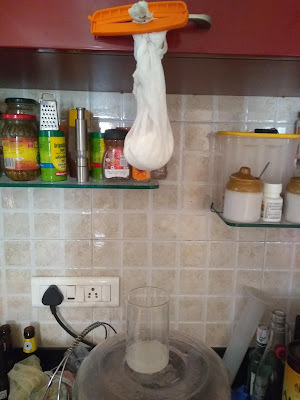 Put the dahi in the cloth, and hang it. Collect the whey into a container. Make sure everything is sanitized before use. Step 5 - Add the collected whey into the kettle. 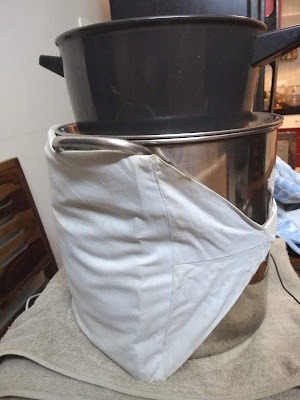 Step 6 - Insulate the kettle with a blanket / towel. We want to maintain a temperature of about 35C for the next 48 hours. This helps raise us to raise the temperature to maintain 35C. The heavy pot on top adds weight to keep the lid sealed securely. It's okay if you don't have a thermometer like this one. Step 7 - Wait for the wort to sour. Keep checking the pH of the wort every 12 hours. We want to achieve 3.4 - 3.5 pH. 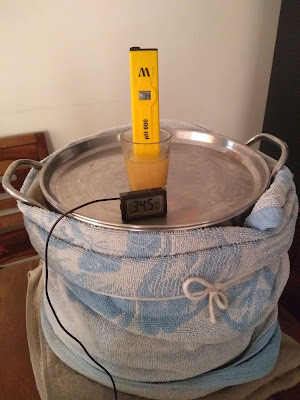 If you use a heating bag like me or if you have warmer ambient temperature you should hit the target pH in about 48 hours. But don't worry if you don't have a heating source. It may take more time, but you will eventually get there. Boil the wort and continue with the usual brewing process. Add the hops at 60 mins, coriander seeds at the end of boil, cool down the wort, pitch the yeast and ferment. You will notice that the fermentation takes a little longer than usual, because the yeast is struggling at that pH. So feel free to add an extra gram of yeast. 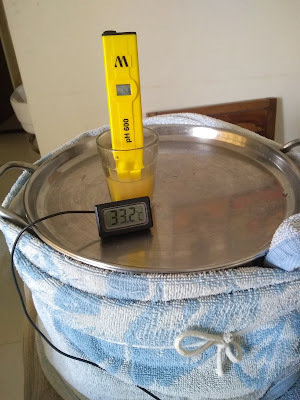 What if you don't have a pH meter and a thermometer that you can tape on the kettle? Use your palate. Just leave the wort to sour for 48 hours. Do not taste it before 48 hours. Experts worry that if you do so, you might get an upset stomach. That's for Americans, we have a strong stomach, so I just tasted it all the time :). But I warned you. Use the taste and smell method in Step 8. Always remember that it will taste a little sweeter and less sour right now, but after the sugars are fermented out, the sourness will come through. The acidity in the beer was nice and bright. It was a comfortable sour. The addition of salt helped balance the sourness, and the wheat malt provided a good body. It had good complexity on the palate. The nose was not as bright as I would have liked. There was some smell of whey on the nose. Not bad at all, but the coriander was not coming though as much as I would have liked. Some tasters wanted a little more salt, so a pinch of it was added to the glass. I would try the same method and use Lactobacillus Delbrueckii, a strain commonly used by professional brewers for souring. Add more coriander or maybe get a fresh packet of coriander. 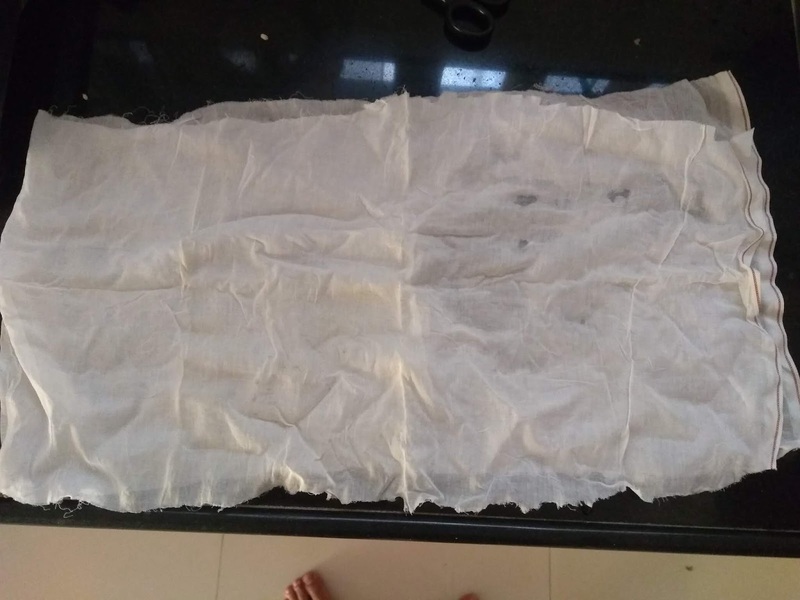 What about adding other spices / peels to get a more complex nose ?